Everyone's heard the fact the the words you say are less important than they way you say them. So why trust your most important words to an inferior podium mic. Get the quality you demand from a name you can trust, with the Sennheiser MEG 14-40 gooseneck condenser microphone. 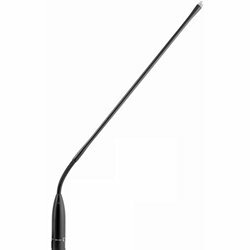 This amazingly flexible mic features a 15.75" gooseneck that lets you put the element right where you need it. The MEG 14-40's focused sound is perfect for speech, and its KE10 cardioid capsule picks up your voice while rejecting off-axis noise. So get the quality sound your presentations deserve and order a Sennheiser MEG 14-40 from GearNuts.com today!